Fans talk about the possibility of winning a national championship all the time. It’s The Dream. Members of the media banter about it, too. It’s a great topic for talk shows during the off-season of any sport. It plays to the ego and interest of the fanbase they serve. Even the most serious sports journalists get into it. 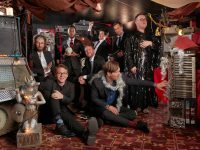 They may or may not have a rooting interest that they have to suppress to report fairly about the team they cover, but every reporter likes to sink themselves into a big story. Occasionally there are bigger off-the-field stories to cover in sports journalism, but in general, there is nothing as enticing to cover in collegiate athletics as a national title run. O.K, all of that is fairly obvious. So what’s the point? The point is that while it is fairly common for folks on the outside to talk about the possibility of a national title, it’s uncommon for a coach to do it unsolicited — even one as good as Dave Van Horn — like he did before the beginning of the current season. Van Horn is a no-nonsense kind of guy. He’s not full of bluster, and he’s not a self-promoter, but from the get-go this year, Van Horn felt his Razorbacks had a shot at not only making it to the College World Series, but also a chance to win it, and he made that known to the public. Now, think about it. It’s a feat just making it to the College World Series. There were some legitimately talented teams that have been at home watching the last two weeks. Think about how good teams like Stanford, Ole Miss, and Georgia were. Auburn, too. The Tigers were right there tied with Florida when a ball bounces off a glove and over the fence to send them home for the season. A team not only has to be good but also have the right kind of luck to make it all the way to Omaha, Neb. 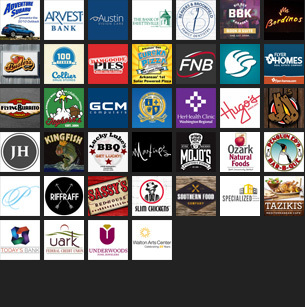 for the College World Series. 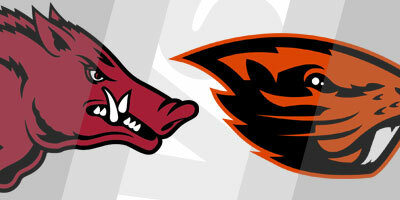 Advancing to the championship series like the Razorbacks (47-19) and the Oregon State Beavers (53-11-1) is doubly tough. The Beavers know that. Coach Pat Casey’s squad fought their way through the loser’s bracket after dropping their first game of the CWS to North Carolina, 8-6. The Beavers have been on a tear since, sending home Washington (14-5), North Carolina (11-6), and Mississippi State (12-2 and 5-2) in succession. The Razorbacks’ ride to the final series was smoother through what many be considered the tougher bracket, but it still wasn’t easy. The Hogs beat Texas (11-5), Texas Tech (7-4), and defending national champion and No. 1 seed Florida (5-2), but their fans were on pins and needles at points in each of those games. 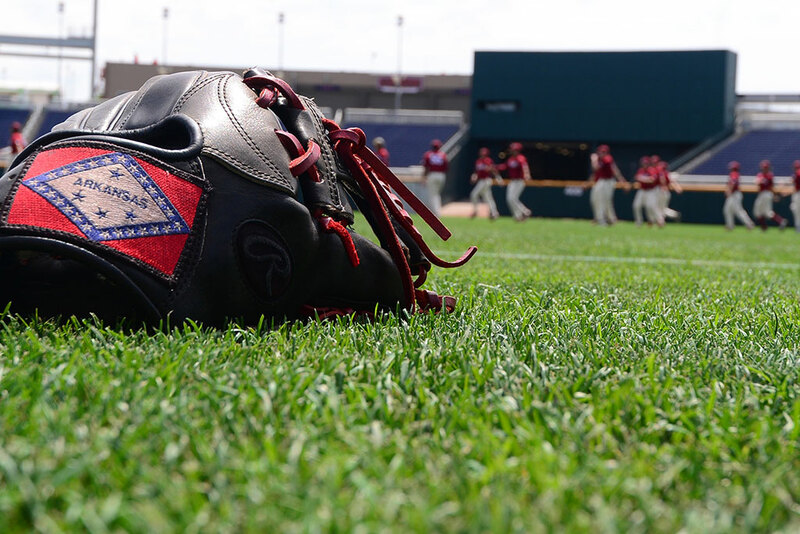 While the Hogs have not lost in Omaha, the slates are wiped clean for the Championship series which will be played out at 6 p.m. Monday Tuesday, Wednesday, and if necessary on Thursday at TD Ameritrade Park. 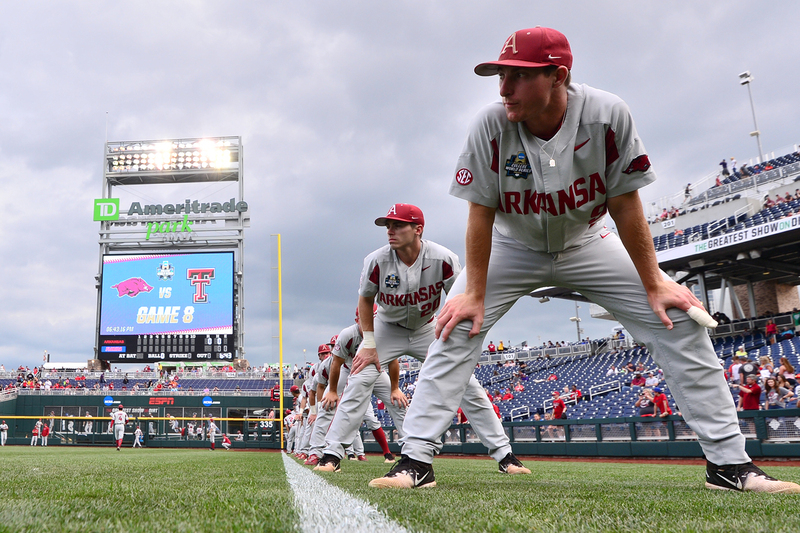 This is rarefied air for the Razorbacks who have not made it to the championship series of the CWS since Norm DeBriyn’s 1979 squad made it there for the first time. That’s been a while ago. Van Horn and Chris Shaddy, father of Hogs second baseman Carson Shaddy, were still in high school back then. Casey’s Beavers won a national title in 2006 and 2007, and they were one of the favorites if not THE favorite to win it all last year. The Beavers are a tough squad, playing neck-and-neck with Stanford in the Pac-12, similar to the way the Razorbacks and Ole Miss chased Florida in the SEC. Perhaps OSU’s most amazing stat is that they have scored 29 of their 48 runs in the CWS after the second out. The Beavers scored at least four runs in eight different half-innings in the CWS. Their 3-4-5 hitters — No. 4 MLB draft pick Nick Madrigal, their home run leader Trevor Larnach and Adley Rutschman — are a power trio difficult to deal with. Tyler Malone has smashed three homers in the CWS, and star center-fielder Steven Kwan is expected back in the lineup after missing three starts with a hamstring injury. Oregon State has one of the best pitching staffs in the nation, but after playing five games in eight days, it is not fully rested. Casey said Sunday that he has several options and would go with who felt best. Luke Heimlich is their ace. He is the Beavers most rested starter, having not pitched since last Wednesday. Bryce Fehmel is on three days rest after throwing 57 pitches against Mississippi State on Friday. Kevin Abel threw 95 pitches in OSU’s victory over the Bulldogs Saturday, and probably isn’t one of Casey’s options tonight. The Razorbacks, on the other hand, will roll out their regular rotation with ace Blaine Knight (13-0, 2.88 ERA) on the mound Monday Tuesday, Kacey Murphy (8-5, 3.15 ERA) for Wednesday, and Isaiah Campbell (5-6, 4.12 ERA) for Thursday if necessary. Knight has been good in the postseason, but not at his best. The Hogs need him on top of his game tonight. The Razorbacks have not been as red hot as Oregon State at the plate, but they have been close. The Razorbacks’ secret sauce all year is the depth of their batting order. If one hitter is a bit off, that’s O.K. because two or three others pick up the slack. Five Razorbacks — Eric Cole (14), Casey Martin (14), Heston Kjerstad (14), Carson Shaddy (13) and Dominic Fletcher (10) — have hit double digit homers, and designated hitter Luke Bonfield is on the cusp with 9. 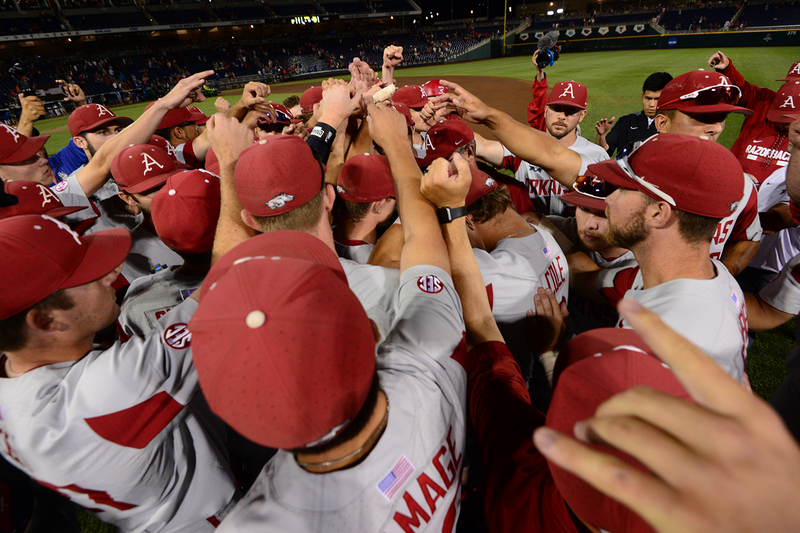 One can argue, the Razorbacks played their best baseball of the season last week. What a great time to be peaking. However, baseball is a fickle game, and unlike in other sports where a squad only has to be at its best once to win a championship, the Razorbacks will have to take two of three against Oregon State to bring home the national championship hardware. Van Horn suspected that this squad had the stuff of champions since the beginning of the year. He and his coaching staff did an excellent job of guiding the Razorbacks into position to grasp Arkansas’ first baseball national title. The ball can bounce many different ways, but sitting here today, it’s hard to believe that these Hogs won’t make something of a prophet out of their head coach.